2. It’s narrated by Death. 3. It’s about a young girl who steals books. You may have picked up on this little tidbit of my personality by now, but if not, let me clue you in: I like happy books. Oh, I’m fine if the characters have to go through some serious trials and tribulations to get there, and I’m even okay if some good characters bite the dust, but ultimately, I like happy endings. Good triumphs over evil. True love conquers all. Sunsets are ridden into, fat ladies sing. I also like action. Daring escapes, epic battles, heart-pounding adventures. I read for fun, as escapism, because life is hard and complicated enough as it is. If I’m going to engage in some form of entertainment, I want it to be entertaining. Obviously, I love some books that are exceptions to these these two rules. But by and large, that’s what I go for. So, knowing this about myself, I was kind of nervous about starting a Holocaust book narrated by Death. Those two things reeeeally didn’t add up to “action-packed entertainment with a happy ending” to me. But the book came highly recommended from several friends I trust, so I picked it up anyway. The Book Thief is Death’s account of the life of Liesel Meminger, a young girl given into foster care by her desperate mother. Her foster parents, Rosa and Hans Hubermann, are struggling to make ends meet in Nazi-occupied Germany. Shortly before going to live with the Hubermanns, Liesel steals a book from her brother’s grave site: The Grave Digger’s Handbook. One night, awakened by nightmares of her dead brother, her patient foster father begins to teach her to read the book. And once she has mastered The Grave Digger’s Handbook, Liesel begins to take other books. Not frequently, and never more than one at a time. It’s a compulsion she never fully understands, and rarely denies. Liesel’s thievery spans several years in their small town of Molching. During that time, she befriends the miscreant boy next door, Rudy. Her Papa hides a Jew, Max, in their basement. She witnesses book burnings, rousing speeches, and parades of captive Jews through town. She struggles through school and her required Hitler Youth meetings. She forms a tenuous relationship with the mayor’s wife. She hides from bombings in a neighbor’s basement. And through all of this, Death watches, fascinated by Liesel and her need to take books. But Death is never able to simply sit and watch. For this is Germany in the early 1940s, and Death has a job to do. This book is not for everyone. Not by a long shot. It’s not fast-paced (it took me an entire week to get through, which is like 5 years in book-reviewer world). It’s sad. It’s set during one of the darkest periods in human history. It’s narrated by Death. So even though I’m about to give a positive review, you have to consider all of these things before deciding whether this is a book you want to attempt. That said, this was a wonderful book. It’s very different from most of the YA fiction out there. The writing style almost made me feel like I was floating above the story, or dreaming it. Death views everything happening in Liesel’s life calmly. Death doesn’t make many judgments about what he is witnessing. He is intrigued, and sometimes feels sorry for the people he is observing, but he is mostly detached from the events. It almost gave the book a hazy feel, if that makes any sense. Also, since Death exists outside of our perceptions of time and space (and since he is Death), he sometimes jumps around in the narrative. A character will have something happen to him, and suddenly Death will interject his own thoughts about that character’s death, sometime later. And then we’ll be back in the present again. Sometimes a death is mentioned briefly early in the book, then explained fully later. Other times, Death merely alludes to the character’s later death, and that’s the last we ever hear of it. Some people find this off-putting or spoiler-ish. But seriously, everyone dies, someday. And I imagine if I was Death, I’d view people’s actions through the lens of their eventual and inevitable deaths too. As for the human characters, I never felt like I truly knew or completely understood them, because Death doesn’t fully know or understand them either. But I was able to feel them and sympathize with them. I could see many nuances and facets to each of them, but always with a slight sense of detachment. It’s a hard feeling to put into words. Normally, if I don’t feel fully connected with the characters, I can’t enjoy a book. But the detachment in this book seemed very deliberate, instead of the author just not knowing how to make me feel connected. As for the plot itself, this isn’t a typical Holocaust book, in that we don’t ever venture into the concentration camps (with the exception of Death’s haunting recollection of carrying souls away from the gas chambers) and the main character is too young to fully understand what is going on around her. Liesel’s main concerns are obtaining food, reading her books, and spending time with her friends and foster parents. The main exception to this is the time spent hiding Max in the basement. But even then, Liesel is more concerned with the stories he tells and the friendship they form. She doesn’t care that he is a Jew, and doesn’t spend much time pondering his fate if he is ever found out. There’s a bittersweet innocence to her story. She can go to Hitler Youth meetings, attend book burnings, and hide a Jew in her basement, but she is still largely ignorant to the horrors of the world around her. Of course, even a child can’t be oblivious forever, and once the war finally comes directly to Liesel, it is heart-wrenching. I cried towards the end of this book. I pretty much never cry during books (I think the last time I cried was when I read The Chamber by John Grisham in 1998, and I still can’t really explain that one), but I cried while reading this one. The only thing stopping me from a full-on gulping and hiccuping ugly-cry was the fact that my husband was sleeping in the bed next to me, and I didn’t want to wake him up (plus, I kind of thought that if I did wake him up, he may make fun of me for crying so hard at a book. And I didn’t feel like explaining why it was totally justified). I wasn’t prepared for how hard it was going to hit me. As I mentioned before, I felt like I had gone through the bulk of the book as a detached observer. I didn’t feel completely connected to the characters, although I didn’t mind. And yet at the end, I could barely even breathe through the tears. The Book Thief is a story of regular people doing the best they can during a period of unspeakable evil. It’s a story of Death being fascinated by life. And a story of a child being a child, in a world where innocence is a luxury few can afford. Content guide: Wartime and concentration camp imagery, Nazi propaganda, mild language, lots of death. 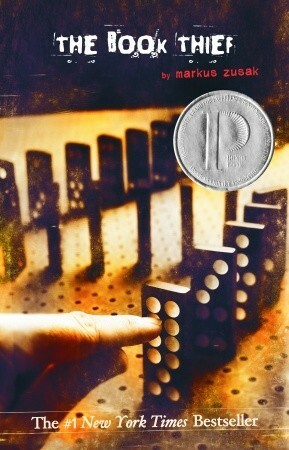 This entry was posted in Historical Fiction, Review, Young Adult and tagged death, fiction, germany, hans hubermann, holocaust, liesel meminger, markus zusak, molching, the book thief, world war II, young adult. Bookmark the permalink. Thanks for this review! Like you, I like happy books and rarely read anything that is sad, but I’ve heard so many good things about this book that I think I’m going to give it a try! Ok, so this book brought back all the really terrible memories I have about watching The Boy in the Striped Pajamas. I watched it alone. My husband was at work. I was supposed to be writing my thesis. Instead, I was watching this movie that TOTALLY messed me up. He got home and I was all like “OMG I NEED TO TALK ABOUT THIS.” Then I cried. A lot. It was haunting. Good, but haunting. It’s a book too … but I’m afraid to read it. I don’t think it would traumatize you as much as TBITSP, simply because Liesel is removed from most of the greatest horrors of the Holocaust, like the concentration camps, and only one of the main characters in the book is a Jew. And the narrative only focuses on him during the time he’s living in Liesel’s basement. So you’re still aware of all the terrible events going on around them, but you don’t have to experience it first-hand for the most part. But on the other hand, I haven’t read or seen TBITSP, so I can’t say for sure. Book Thief is sad and haunting and made me cry (a LOT), but didn’t traumatize me the way I expect TBITSP would (which is why I haven’t seen/read it yet). Yeah, TBITSP (the movie, at least) was pretty much following the young boy protagonist. I really did like it and it did a great job with showing the world through naive eyes. It was the end that did it, I think. No spoilers. Even though I haven’t read the book, I’d probably recommend starting there. There’s something about reading about things like this that softens the blow a bit for when you watch. I definitely wasn’t prepared. The Book Thief sounds fascinating. I’m sure I would love it if I only had some nerve. I’ve already been spoiled. I can’t go into Holocaust fiction without spoilers. I need to be prepared. And often, it keeps me from even attempting it. I just can’t handle the horror of that time. But I probably will attempt the book someday. Even though it will make my heart hurt terribly. I probably won’t ever watch the movie though. Actually seeing it is too much for me. If you could handle TBITSP, you can probably handle TBT. Can’t say for sure, since different things affect different people in different ways. But that’s my opinion based on the synopsis. Just make sure your husband is there for you to cry on when you’re getting close to the end.